Katie Can Too! : 5km. Finally. 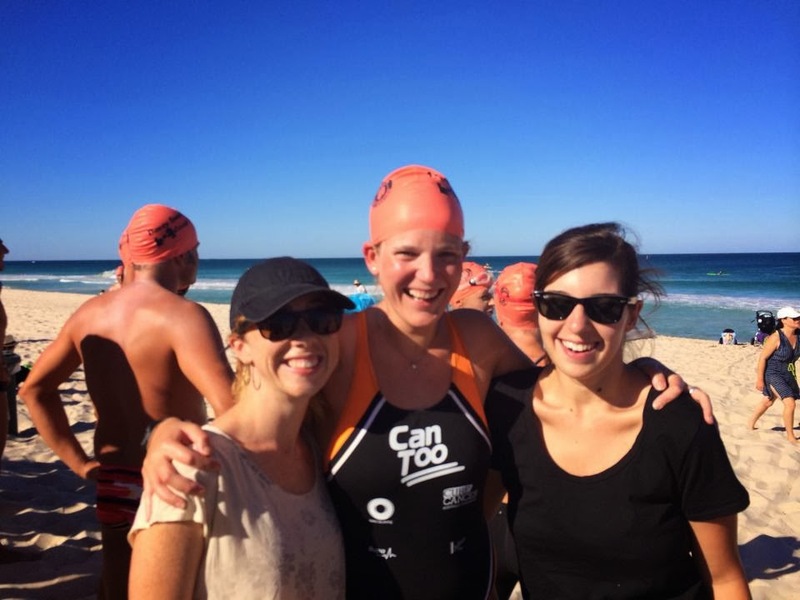 After finishing my first Palm to Whale Big Swim in 2010 I set my sights on a 5km swim. I thought there was only one in NSW that didn’t clash with Can Too commitments: Coogee to Bondi. In 2010 I suffered a debilitating bout of sea sickness in the Malabar swim, didn’t train enough and so deferred to 2011. 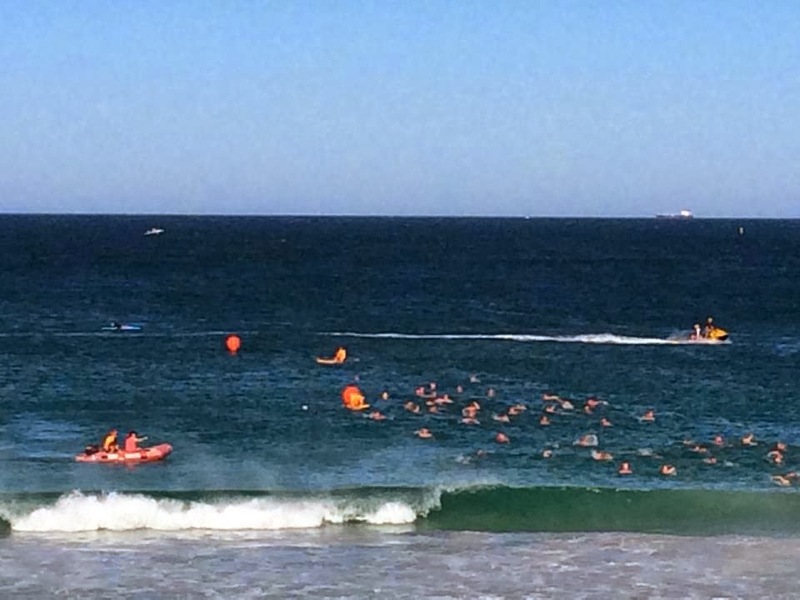 When the race was a complete schmozzle and reset to a swim inside Coogee. After an hour and a half standing in the freezing rain whilst they reset with no announcements I gave up and headed for home. In 2012 I came down with an awful flu / cold thing that bound me to bed for a fortnight, coinciding with my bronze part B assessment to become a surf lifesaver resulting in a failed boards component and meant I couldn’t swim. 2013 they didn’t run the race because they were setting up a SUP board business. God knows what will happen in 2014. It should be noted that most of the ocean swims are run by surf clubs and they do it very well. Some are run as private profit making exercises (like the Cole Classic) and are quite expensive but are still very well run. It is incredibly hard to run a journey swim from one beach to another, when that swim crosses the territory of two councils and 5 surf clubs. However, Mermaid Jo, who coaches at icebergs has never impressed as a race organiser. Despite a $75 race fee there was an abject failure to communicate in 2011 and the final buoy was moved without warning after the winners had passed it in 2012 - both poor efforts. So it’s unsurprising that a great, epic, journey swim has yet again fallen into disrepair. It would be great to see the surf clubs take this on. So following on from the previous abject failures to swim 5km I did what the Pet Shop Boys have been telling us to do for years: Go West! My gorgeous gal pal, the ever lovely Courtney calls Perth home. We met in The Hague and have hung out (both east side and west side) a few times since returning to Oz in 2008. Great incentive to head west to tackle my first 5km. The Davey Real Estate Sunset Coast Swim 2014 is run by Scarboro SLSC on Scarborough beach (confused yet?). It’s a 2km loop followed by a 3km loop. They also run a 2km and a 1km swim. There is also a 1:40 time limit. Always a great idea to read the fine print. Coogee to Bondi has a 2 hour time limit to clear McKenzie’s point so it’s about 2:20 in total. These Western Australians are fast. I am not. This is a problem. The winner did this swim in 50:26. That’s 10 minutes per kilometre. I am stoked to hold 20 minutes per kilometre. Heading to the race briefing I run into my great Can Too swim mate, Alice Boxhall, who lives in San Francisco but happened to be in Perth for a conference and encouraged her friend to try the 1km. Such a boost. Beautiful, random moment. Scarborough is an unbelievably beautiful and long beach. Always lovely to have something nice to look at. Deep water start, we tread water between two buoys and we’re off. I’m dead last from go to whoa. I’m in it to complete not to compete. The 2km lap is easily done, sighting is a little tricky in this super flat water but it’s so clear and blue I can hardly complain. Onto the 3km lap. With 15 minutes and 1km to go the water safety starts harassing me. They tell me I have 10 minutes to go. I’m timing myself and know I have 15. I give back as good as I get and I’m told “let’s just get you to the finish line”. I’ll show them. The kick kicks in and I cross the line in 1:39:54. 6 seconds until being disqualified. Waste not, want not. An otherwise great swim marred by a very different attitude to ocean swimming than what I’m used to - encouraging participation. However, absolutely stoked to finish and finally complete a long standing goal. Did I say stoked? I meant STOKED!!! Catch up with Courtney in yet another great café (Perth hipster culture is absolutely brilliant). Somehow we manage to work out a plan that involves a crazy roadtrip, including catch ups / meetings / love matches with the gorgeous Kristy – Courtney getting back into town in time for a meeting and my seeing even more of the gorgeous Western Australia – including idyllic rural backwaters. So we hit the road. Which is partly melting in 40 degree heat. Thank goodness some like it hot, including me. And all three of us love a good devonshire tea. Even in the road melting heat. 5 hours and 420km later we hit Albany. Which it turns out is a hive of cool hipster bars, great restaurants and an unbelievable waterfront arts centre. We all have hot chocolate at the seriously cool bar because we’re super cool and all. It’s also housed within our hostel. Next morning I realise I may have outgrown hostel accommodation as an epic 3am spooning sesh in the bed below impairs my pre race sleep plan. Kind of hilarious though. We head to Middleton beach on Albany Harbour about10 mins out of town. This is my kind of swim. Casual, relaxed, and with a 2 hour cut off. 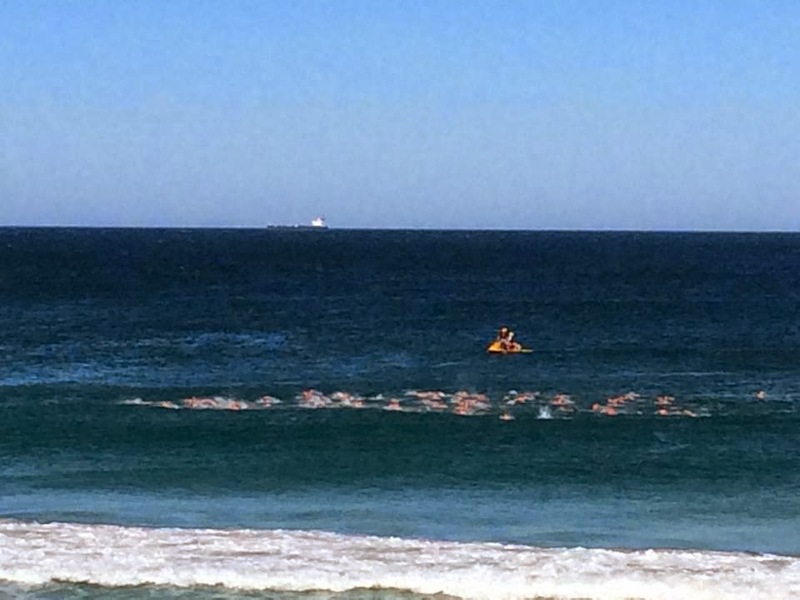 It’s a 1.25km loop, so they run a 1.25m, a 2.5km and a 5km swim all starting at the same time. With our red, yellow and green swim caps we look like a traffic light convention at the deep water start. Again, this is all about pacing. Feeling surprisingly fresh after yesterday I don’t go quite as slow at the start. (I probably did my first km at warm up pace yesterday). By the end I’ve been lapped by just about everyone doing the 5km swim and have my own personal board paddler who tells me “I’m awesome” and when I give her a massive hug at the end tells me she’s awed (especially by the consistency of my pace). Better than a win any day! Finishing dead last is so much better than not finishing. Simply the most stunning location. Photos below are from the gorgeous coastal walk back into town. Love WA and its inhabitants. 5km is not to be attempted lightly, especially with crazy fast time limits. I did a mix of pool and ocean swim training for this. Including a couple of 4km swims on Christmas Day and New Year’s Eve getting up to 20km a week in total. I find a mix of pool technique and interval sessions combined with long ocean swims works for me.